Eternal Orthodox Church calendar for the 03.11 year 2017. As a rose growing among thorns, so was this great saint born of pagan parents in the village of Tabatha near Gaza in Palestine. His parents sent him to study in Alexandria, where the gifted youngster quickly assimilated both secular learning and spiritual wisdom. Coming to know Christ the Lord and receiving baptism, he desired to serve the Lord with his whole heart. With this desire, Hilarion visited St Antony the Great in the desert and became his disciple. He then returned to his homeland and lived in asceticism near Maiuma, not far from Gaza. Demons tried to frighten him with various terrors, but he, with prayer to God and the sign of the Cross, overcame them all and drove them away. 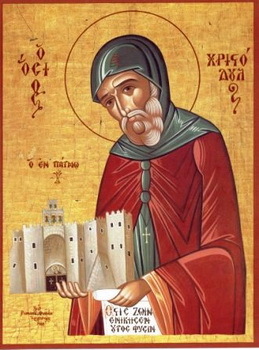 A great many who were desirous of the spiritual life gathered around him, and St Hilarion became for Palestine what St Antony was for Egypt. A divine teacher, a strict ascetic, a marvellous wonderworker, Hilarion was revered not only by Christians but also by pagans. He, though, fearing the praise of men and crying out through his tears: "Woe is me, for I am getting my reward in this life! ", fled from place to place simply to hide from men and remain alone with his soul and God. He therefore settled and lived for a time in Egypt, Sicily, Dalmatia and finally in Cyprus, where his life of great toil came to an end in about 372, when he had reached the age of eighty. Hilarion"s wonderworking relics were taken by Ezekiel, one of his disciples, to Palestine and laid in the monastery that he had founded. He was born of eminent and devout parents. His childless mother had long prayed to God to give her a child and, when she was at prayer, the most holy Mother of God appeared to her and comforted her with the words: "Don"t cry; you will have a son, and he will bring many to the light of truth." When Hilarion was only three years old, the hymn: "Holy, holy, holy Lord God of Sabaoth" was constantly heard on his lips. Well-educated, he became a monk at the age of eighteen and founded a monastery based on the rule of St Pachomius. 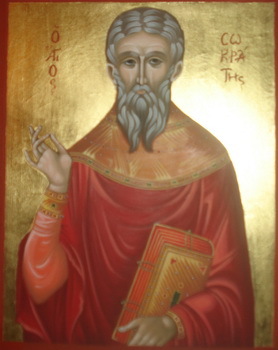 In 1134, he was consecrated Bishop of Meglin by Eustathius, Archbishop of Trnovo. 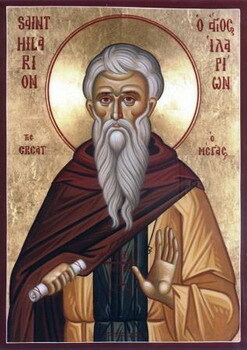 St Hilarion had an almost lifelong struggle against the Bogomils and the Armenian heretics, but, by his spiritual learning and unequalled holiness, he put them all to shame and brought many of them to Orthodoxy. He entered peacefully into rest and went to the Kingdom of his Lord in 1164. Born in Crysopolis in Macedonia, he was taken from his mother, a widow, by the Turks and thrown into prison along with one of his brothers. They were miraculously delivered from prison by the most holy Mother of God, and taken to a monastery in Neapolis in Asia Minor. Their mother later found her sons as monks, and herself became a nun. Philotheus went to the Holy Mountain, where he lived first in the monastery of Dionysiou and then in the wilds. A wonderful ascetic and a great conqueror of demonic powers, he entered peacefully into rest at the age of eighty-four. He left instructions that he was not to be buried, but that his body was to be thrown into the forest for the birds and wild beasts. Later, a fisherman saw a great light in the forest at night, and, being frozen, went to warm himself at it, thinking it was a fire. The light was, however, coming from the wonderworking relics of St Philotheus. 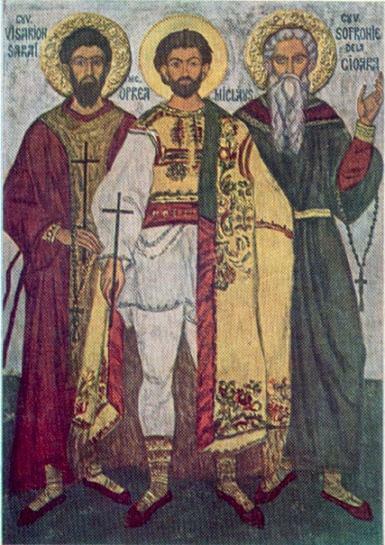 The Holy Martyrs Dasias, Caius and Zoticus accepted a martyr's end in the year 303, under the emperor Diocletian (284-305), for the destruction of an idolous temple. 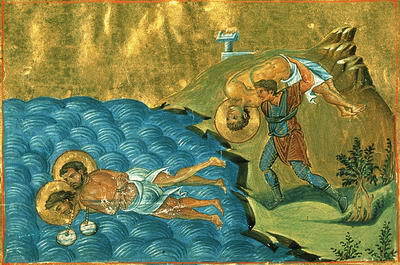 After tortures the martyred were drowned in the sea. 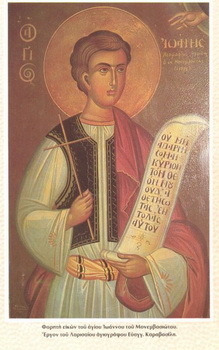 Saint John was from Monembasia in the Peloponnese. At that time the region was under the Turkish yoke and subject to frequent raids from Albanians who captured Christians to sell them as slaves. In the course of one such attack, John's father was killed and the young boy and his mother were taken as captives to Larissa, where they were sold to a Turk from Thessalonica. This man, who had no son, wanted to adopt John and make him a Muslim. But nothing was able to persuade the fifteen-year-old youth: attractive promises, threatened beatings, the magic arts the Turk's wife used to make him lose his chastity, all were in vain. John remained as immovable as a rock and preferred to starve for days on end than break the fasts of the Church. The Turk became enraged at his failure to prevail over his young slave, and ran a sword into his stomach. For two days John suffered in agony before he departed to the abode of the blessed. 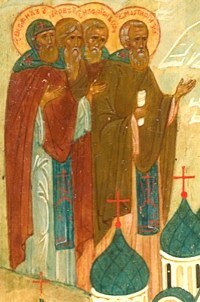 The Monks Theophil and Iakov (James) of Omucha asceticised on the island of Konevetsa together with the Monk Arsenii (Comm. 12 June). In the year 1396 in Pskov diocese at the River Omucha, not far from the city of Porkhov, Saints Theophil and Iakov established a wilderness monastery in honour of the Uspenie-Dormition of the MostHoly Mother o God. Their demise occurred later in about the year 1412.